New security threats, particularly along our southern and eastern border, created a host of new challenges for NATO in 2015. The Joint Air Power Competence Centre has been at the forefront of those issues, helping the Alliance’s military leaders establish and adapt policies and procedures to address these needs. Over the following pages, the 2015 JAPCC Annual Report will highlight the key developments, projects and research shaping Joint Air and Space Power. In November 2015, the JAPCC hosted its annual conference, this time at a new venue in Essen. The conference was once again an outstanding platform for substantial discussion, this year exploring the topic ‘Joint Air Power and Strategic Communications’. Multiple panels, filled by expert representatives from the military, industry, and academia made this event extraordinary. The presentations and subsequent discussions were revealing and gave substantial food for thought. In addition to the biannual JAPCC Journal, the organi­zation published several studies, offering implement­able solutions and alternatives for senior leaders within NATO. Since it is imperative for any military operation to have current and correct information, Intelligence, Surveillance and Reconnaissance (ISR) is of utmost importance. In order to maximize the synergy of NATO’s ­approach, JAPCC studied options for a multinational and joint ISR approach. The developed short-, mid-, and long-term options could augment NATO’s capabilities and support the multinational procurement process of Remotely Piloted Aerial Systems. Another study of signifi­cant importance was made in the field of air mobility. Helicopters are the backbone of tactical flexibility on the battlefield. In order to have a homogenous standard across the different nations who provide this scarce resource, standardization of training and procedures is an important factor. JAPCC undertook a study to analyse the benefits of standardized helicopter crew training in order to guarantee a certain quality of Air Power. The JAPCC, due to its unique personnel composition of subject matter experts, was an important contributor in the development of various NATO doctrinal and policy documents across a broad spectrum. Our experts are a much sought after resource by a variety of working groups and panels. 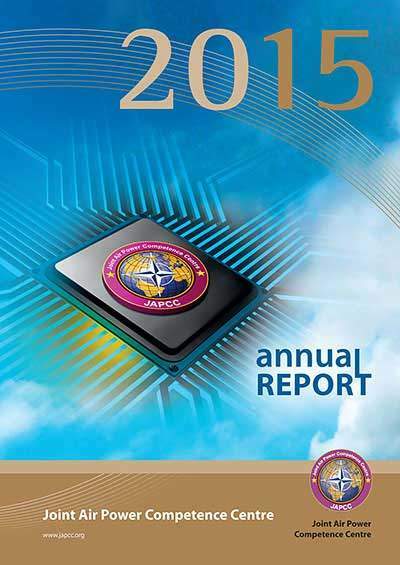 As the main custodian of the Allied Joint Publication 3.3 about Joint Air and Space Oper­ations, JAPCC significantly updated this document to be compli­ant with NATO’s current challenges and capabil­ities. JAPCC members also worked closely with the NATO Military authorities to develop the Joint Air Power Cap­abilities (JAPC) study, which examined the future stra­tegic environment out to 2030 and made recommendations and requirements for NATO’s Air and Space Power Cap­abilities in that time frame. Recently, JAPCC was invited to contribute to NATO’s JOINT AIR POWER STRATEGY. Since NATO can best approach transformation in a joint and combined fashion, multinational forums are one of the most important instruments to warrant a corporate understanding. For example, the topic of last year’s Think Tank Forum was the standardization and execution of multi­national projects, which will augment the pro­ductivity and decrease redundancies of all future multi­national initiatives themselves. Also, the Air and Space Power Network (ASPN) Meeting played an important role in solidifying a cooperative understanding of our future common security challenges. NATO’s Joint Air and Space Power can only be robustly elevated to the next level through innovative and comprehensive approaches like this. Without any doubt, we are living in times of rapid, uncertain and constant changes in the Alliance’s security situation, which make Collective Defence, Crisis Manage­ment and Cooperative Security of paramount importance for all of us. Joint Air and Space Power was and will remain a keystone element within NATO’s security strategy and JAPCC is most certainly ready to continue contributing to its excellence.